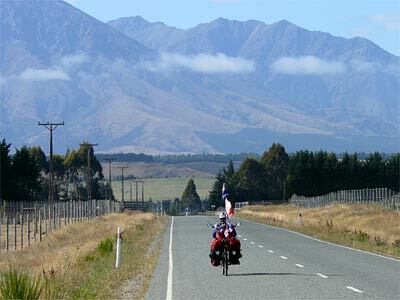 On Saturday, January 26, we got a fairly early start from Manipouri, heading for Tuatepere, the Sausage Capital of New Zealand! It was a small, somewhat faded town with a few tourist-oriented galleries, a grocery store or two, and a couple of campgrounds and motels. When we arrived some time after 4 p.m., the only places that sold local sausage were already closed, so we missed that treat. We did, however, find a quiet little campground where the manager offered us a cottage for only $20. It would have cost $18 for a tent site, so why not! Even in this modest place, there was a nicely equipped communal kitchen with a couple of tables. Though Tuatepere was not of great interest, the 80 kilometer ride there was stunning. 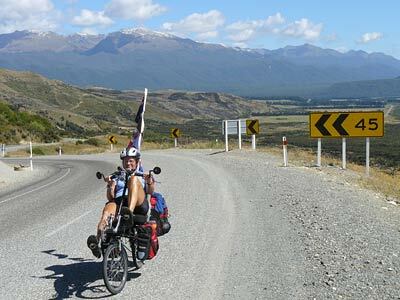 As on many rides in the interior of the South Island, we had a feeling of vastness, nearly unlimited spaciousness, perhaps something like the transition between foothills and prairie in Alberta or Montana. 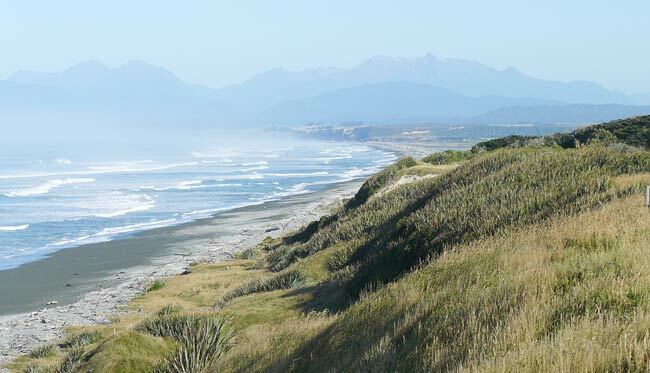 People say that the west coast, between the mountains and the sea, is the most spectacular part of New Zealand, but it will not be easy to surpass this part of the island for splendid cycling. The photos above are climbing up and coasting down Jericho Hill, also called Blackmount Hill, we think, which was the only substantial challenge of Saturday's ride to Tuatepere. 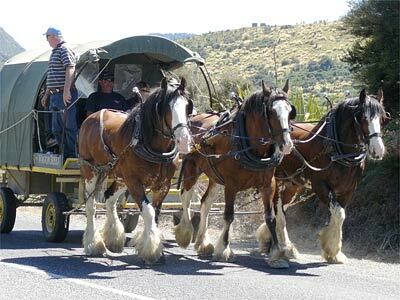 At the bottom of the hill, soon before the tiny hamlet of Blackmount, we passed this team of Clydesdales. They are taking tourists on a  a tour! It looks like fun, but aside from walking it's the only way to travel that is even slower than our cycling. 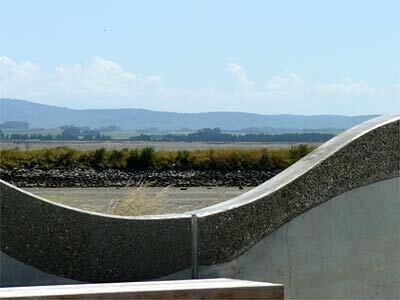 On Sunday, the ride from Tuatepere as far as Riverton was just as beautiful, with continuing perfect weather, except now we reached the south coast, so there were gorgeous beaches as well. 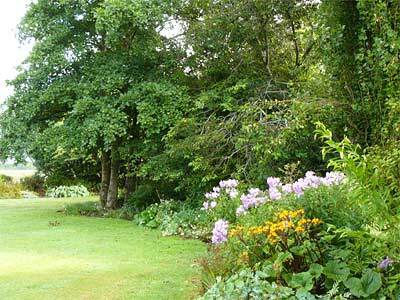 The coutnryside was becoming greener too, and sometimes we were reminded of parts of the Maritimes  but with much bigger mountains. The two photos below are both taken from McKracken's Rest, one in each direction. It is the first point at which we reached the southern coast. 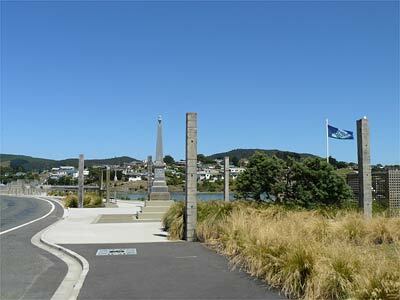 Riverton was a pleasant town on an estuary, with a fine little museum and riverfront park. 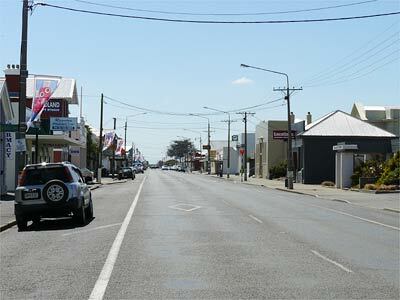 The photo to the right is the main street. The two below are taken in Riverton's small waterfront park. We enjoyed visiting a shop that sold articles made of paua, something akin to abalone shell, with wonderful iridescent colors. 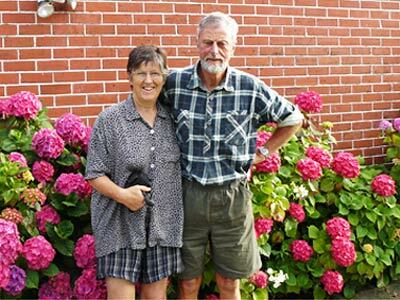 Our goal on Sunday was the sheep and deer farm of Servas hosts Adrian and Ann Irving, northeast of Invercargill proper. It turned out to be a little farther than we'd thought, about 105 kilometres from Tuatepere. 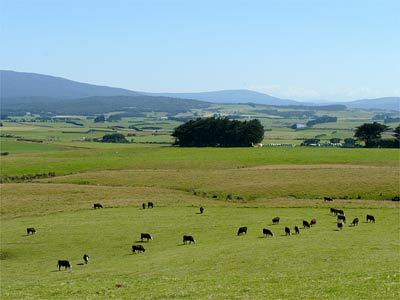 The photo on the left is a typical scene in this part of the country  though as we approached Invercargill, the terrain gradually became flatter in less photogenic. The last 3 kilometres to the Irving's farm were on gravel, so we arrived tired. 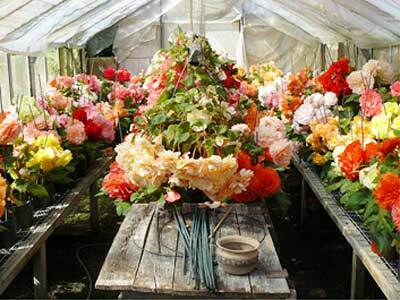 Ann and Adrian had wonderful gardens  Adrian grows begonias in glass houses  and of course thousands of sheep and deer. 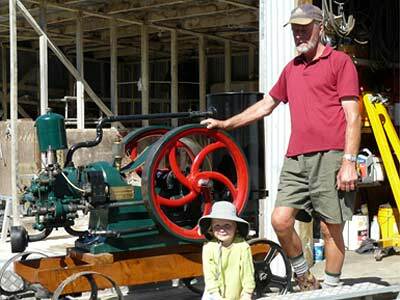 Adrian collects and restores antique engines and had just returned from Crank-Up!, a big machinery show that we had already heard about. Ann fed us well, not suprisingly with venison and lamb, and made us very comfortable. 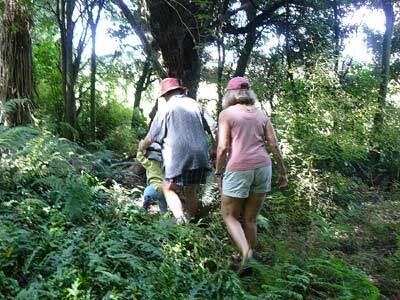 Their daughter Terry took us on a four-wheeler to move some sheep, and Ann with her cute granddaughter Cassia led us on a walk through native bush that they are preserving. 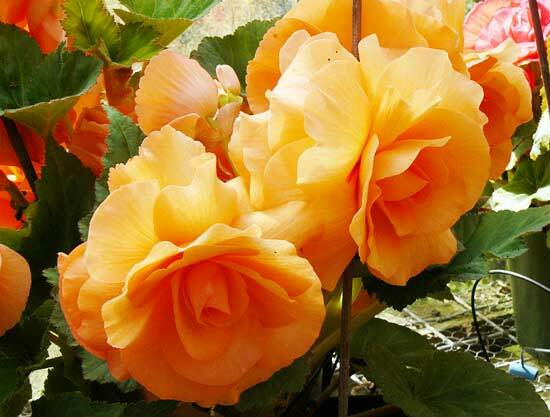 Some of Adrian's spectacular begonias.